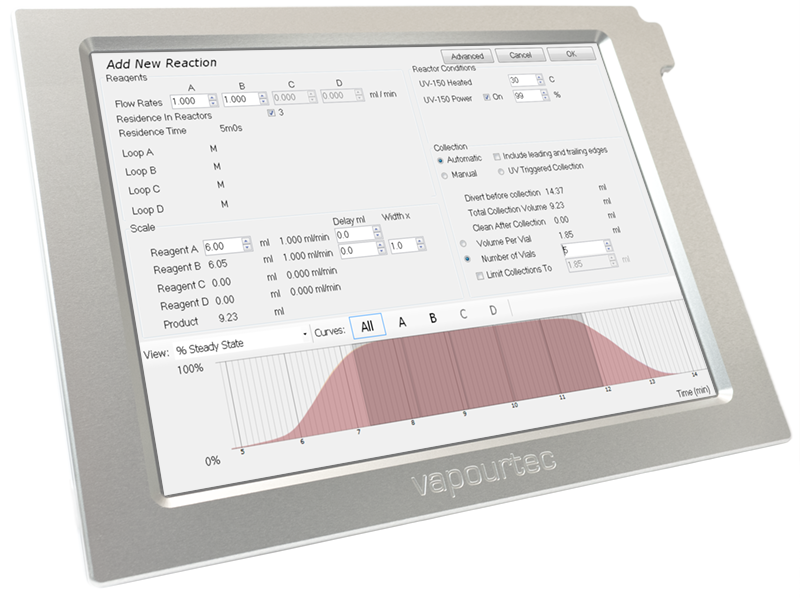 The Vapourtec Flow Commander™ software features the facility to model the axial dispersion that takes place with tube reactors, so that it is possible to automatically predict, (and correctly time the collection of) the steady state part of the reaction product stream when it emerges from the reactor. This means it is possible to collect the optimum amount of good product with the minimum waste of reagents, and it is possible to determine exactly how much good product can be made from a limited amount of substrate. So why would anyone want to trigger collection from a UV or IR sensor ? The answer is that there are some circumstances (for example with heterogeneous columns) where either the dispersion is hard to accurately model (because the flow characteristics of the column contents simply cannot be known in advance), or else the working volume of the column reactor (the volume of the cavities between the substrate) is not accurately known. In these cases, it may not be possible to simply “predict” the location or shape of the peak, and so perfect collection timing cannot be assured. Flow Commander™software has for some time offered the facility to monitor (and record & chart) the output of a UV or FTIR sensor. 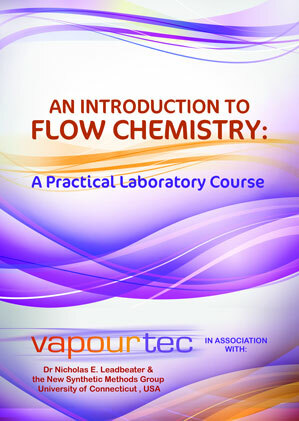 Vapourtec has now added the facility for UV Triggered collection. That is to say, operation of the collection valve is based on the output of a UV sensor located after the last reactor. The user chooses the conditions for triggering. These might be based on either the level or the gradient or both. Criteria can be selected per reaction (i.e. 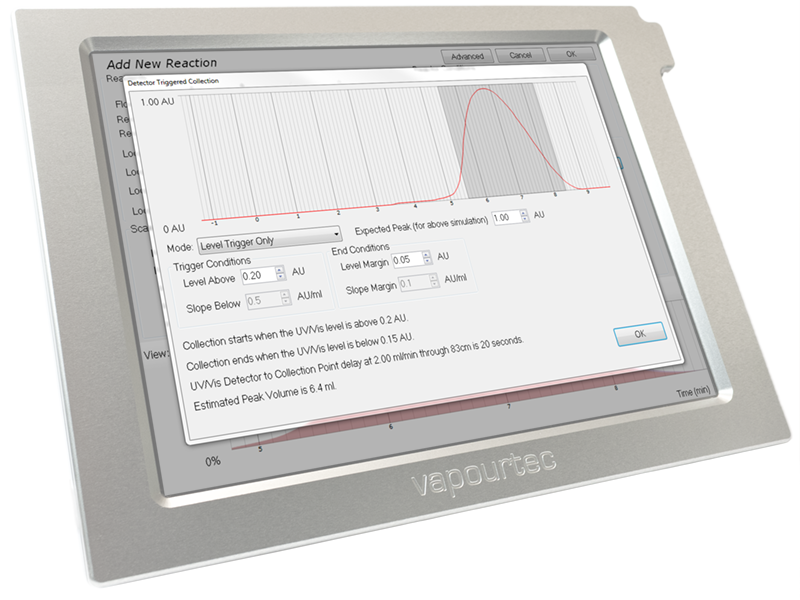 a different trigger level can be set for each reaction in a sequence if need be). Collection will then proceed according to these criteria. In order to help the user visualise the outcome, Flow Commander™ asks for an expected maximum peak and generates a prediction of the UV or FTIR trace based on the dispersion model. This allows the software to have a working estimate of the volume of peak that will be collected. 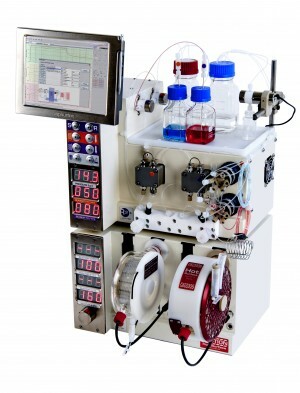 If it is desirable to split the desired output over several vials on a fraction collector, the user specifies a maximum amount per vial (subject to the known maximum for the vial type in question on the selected fraction collector). Based on the volume estimate, a number of vial positions on the fraction collector will be set aside for that peak. If not all these vials turn out to be required (ie if the total volume of the peak is less than expected), the last vial(s) will be left empty. 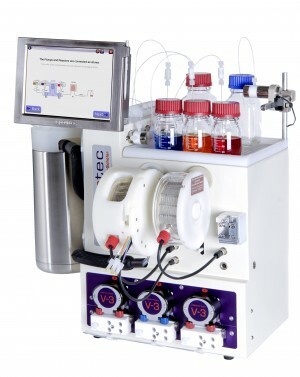 (The peak of the subsequent reaction will always be captured starting at its originally planned first vial position).